Make a collection of these trees in different sizes and set them on a shelf or make them with tiny beads and hang them on your Christmas tree. Either way, these easy to make spirals are bound to be a holiday favorite. The green beaded tree measures 4” high. The pearl tree stands 2.5” tall. All you need to start your collection is beads, wire, ribbon, glue and a little Christmas spirit! Cut a piece of wire to 18” long. Make a loop in one end of the wire. If you need help, see Making Wire Loops/Eyes Instructions in Jewelry Tools and Techniques. String on 35 green 8mm, and 35 clear 6mm beads alternating colors. Make a loop on the remaining end of wire. Be sure there is no excess space between beads so they won’t slip around on the wire. Bend the loop at a 90 degree angle. This is where you will attach a ribbon or ornament hanger later. Wrap the beaded wire tightly around a cone shaped object like a large thread cone or a Styrofoam cone. After wrapping, if your tree top is not as tight as you would like, place a cylinder (like a fat magic marker) that is smaller than the cone, into the center top of the tree and wrap the beaded wire tightly around it. Try not to bend the wire with your fingers as this may create unwanted sharp angles. If after wrapping, the tree is shorter than 4”, stretch the tree in an upward direction while holding the base. Be sure the base of the tree is evenly flat. Once it is you can get the tree to stand on it’s own by lifting curved edges straight up to balance out the weight and prevent it from leaning. 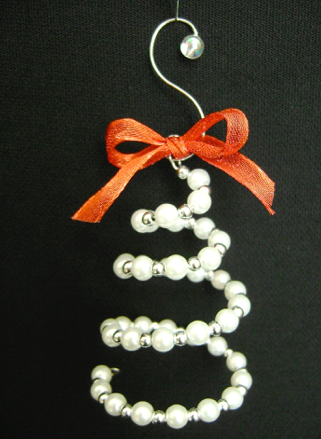 Attach silver metallic cord to the top loop and tie it in a bow. Drape the cord following the line of the tree. With a glue gun, apply a dot of hot glue on one bead at each level of the tree to hold it in a spiral shape. Cut off excess cord and attach the end to a bead at the base with glue. The beads for this project must be light in weight or they will topple the tree. You’ll also find four or five inches is about as tall a tree as you can make with beads unless you use much heavier wire. You can use jewelry glue instead of a glue gun to attach the cord but you will have to find a way to hold the cord to the bead until it is dry.